RFA Cardigan Bay leads minehunters in the Gulf. 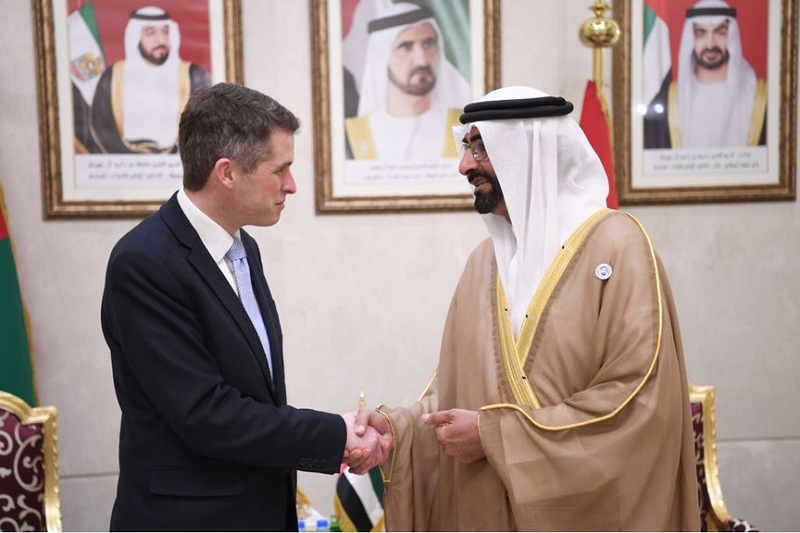 Defence Secretary Gavin Williamson met with the Crown Prince of Abu Dhabi, Mohammed bin Zayed, and his Emirati counterpart, Mohammed Ahmad Al Bowardi, reaffirming the ‘historic and very successful’ defence relationship. The Defence Secretary also commended the role the UAE, a Global Coalition partner, has played in the fight against Daesh. “Our long-standing and deep relationship with our Gulf partners epitomises Britain’s global outlook. Be it through our involvement in the Duqm port project in Oman or the opening of the Naval Support Facility in Bahrain, we are committed to regional security and stability. Williamson met with Ahmed Al Bowardi, Minister of State for Defence in the UAE. “The Defence Secretary also visited personnel on board HMS Middleton and HMS Bangor, which were alongside at Port Zayed. Mr Williamson reiterated how grateful he was for the access and facilities that the UAE provides the UK. The UAE is the most visited port globally by the Royal Navy, highlighting the value Britain places on this relationship in its support to regional stability and security. The officials also reviewed the work taking place at the Duqm port facilities which, in time, will host UK warships and is large enough to welcome the aircraft carriers HMS Queen Elizabeth and HMS Prince of Wales. UK debt is now over £2 TRILLION! Time to sop this nonsense. You could not run your homes like this. Time for cut backs. We are a net importer of oil and gas now TH. So until that changes, I think this is a rather a sensible use of funds. Funding national security is not a nice to have or something optional. I do agree cut backs in government spending are required but this should be targeted at overseas aid which is often wasted in order to meet a 0.7% target, and the enormous public sector pension funding gap. If civil servants where brought in line with everyone else, where they receive what they put in to their pension like everyone else, the UK’s liabilities would drop dramatically. You no we’re at a budget surplus now though right? “RFA Cardigan Bay leads Minehunters in the Gulf”-that is one impressive minehunter at the rear of the flotilla!! Maybe Cardigan Bay was leading because the T45 was under tow! We are organising a number of anti war protests which are attended by members of the public as well. You would be more than welcomed to attend these processions. Although the media doesn’t cover these demonstrations, they are occurring and hundreds and often thousands attend and politicians are made aware. TH is certainly not as mil, as his off repeated gibberish and lack of understanding of military matters constantly shows when he starts to type. And if you read his posts Mr boring veterans for peace, then you would also see that he is certainly spent no time in the military…..but I am presuming you did more than 5 minutes before deciding the job you chose was a little to nasty for you and you left. Omani officers embedded as Loan Device Personnel interesting. What’s the difference between that and the common practise of exchange postings, especially with US and Australian forces. Are we borrowing them?? Is our manpower that bad! You don’t know his ex service credentials do you? People of principle? Really? Wow! Your last few sentences. That is indeed what the trolls want. Its to do with Terms and Conditions. Loan service usually means you wear the uniform of the Armed services you are loaned to and come under their rules. Exchange posts mean you keep your uniform and remain under your own countries rules and regs. It also has lots of tax and bonus implications with regards to your pay at the end of the month. Thank you so much Gunbuster. All, please stop rising up to TH’s taunts. It doesn’t become anyone to do so. You’re just wasting your time. Anyway, I presume that when he talks of marching against war he means the war that Russia is waging against Syrians and Ukraine, doesn’t he? I seem to recall that Britain did the same back in 1939 and we know what happened there. Peace in our time is a fantasy so stop dreaming.